There’s more to printing than meets the eye. Costs, paper weight, mailing options, customization - these are just a few areas for marketers to consider. How do you ensure your needs are met, and budget is maximized? Add local markets that need individual marketing materials printed and you need a simple solution to managing and maximizing printing costs. 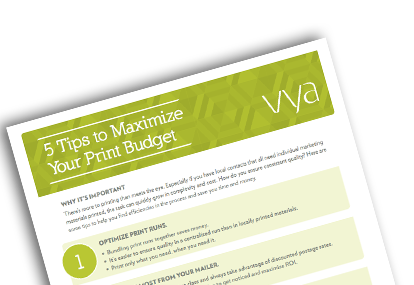 Download our one-page tip sheet to learn 5 easy ways to make the most out of your print budget, and deliver effective, customized materials right to local teams.